The world’s first online gambling company has begun a yearlong celebration of the 25th birthday of its sportsbetting business, established in London in 1983. Intertops.com, which took the first online sports bet ever in 1996, this year also celebrates the tenth birthday of its online casino. Pioneering once again, the company accepted the first mobile bet in 2001 and added a world-class poker room in 2003. Over the years, by staying on top of trends and technology, and by paying players, partners and affiliates quickly, Intertops has earned a reputation for being exciting, innovative, trustworthy and reliable. Two years ago, Intertops celebrated the tenth anniversary of their very first online wager, but the story actually began back in April 1983 when founder Detlef Train revolutionized the German sportsbetting market with a UK bookmaking license from London. He offered punters back home fixed odds as an alternative to the unsatisfactory offers of the state monopoly. The World Wide Web, as we know it today, hadn’t even been imagined back when Intertops was born. The fledgling company began by sending weekly betting slips to customers in Germany who then placed their bets by phone or post. In the days before modern online payment processing, the first Intertops customers sent their stakes in cash by post. The company moved to Austria in 1992 to avoid British postal delays. “By sending betting slips to Germany, 30 million mail boxes were potential remote betting shops,” says Train. Not long after the company set up in Salzburg, and long before many others saw commercial possibilities in the infant technology, Train was dreaming of conducting his business on the Internet. After the unstoppable success of their online sportsbetting business, Intertops partnered with Microgaming to offer the best available online casino games to their customers as well. In 1997, with a strong monopoly on casinos in Austria, the company had to be split up. Train stayed with the traditional betting business in Austria whereas the online part of the company moved to Antigua and started its online casino in May 1998. In 2001, Intertops was the first to take a sports bet via mobile phone and in 2006 launched its mobile casino with many of the Microgaming online casino games adapted for cell phones and powered by Spin3. Lyceum's regular igaming business social in London is celebrating a whole bunch of birthdays tomorrow night at a hip new club in Soho called Maya. 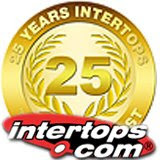 Intertops.com is celebrating the 25th anniversary of their first UK bookmaking license and the 10th birthday of their online casino. Michl Posch is flying in from Austria to make a champagne toast and cut the first birthday cake. Later in the evening the assembled igaming business crew will celebrate the 2nd annual 29th birthday Michael Caselli and Aideen Short. If you're in London and working in the igaming business, get your invitation here and join the party on Thursday night!